American Express incentivizes finishing Halo 4's campaign. Who says gaming doesn't pay? If you're planning to pick up Halo 4 and have an American Express credit card, you could end up pocketing a cool $25 at the end of it. In a first-of-its-kind credit card promotion, Microsoft has teamed up with Amex to reward players who shoot their way to the end of the game's single-player campaign. In addition to bonuses for Amex holders who buy Halo 4, those who finish it can pick up an additional $25 on their monthly statements. The promotion is a first-time collaboration between Xbox Live and American Express, and represents the first time a AAA console title has received a credit card tie-in. Social games have been doing this for quite some time, however, and even World of Warcraft experimented with game time rewards for credit card purchases. Players who link their Xbox Live accounts with their Amex cards will receive a $10 credit and a number of coupons. 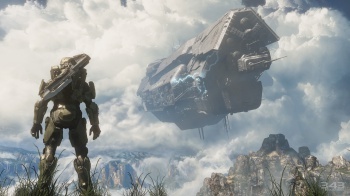 Those taking control of Master Chief in Halo 4 can unlock various coupons and promotions as they gain various in-game achievements, but the big prize is the $25 credit in wait at the end of the single-player campaign. Theoretically, a gamer who already uses an Amex card and links his account upon buying Halo 4 could knock more than half of the game's initial cost off. American Express has indicated interest in pursuing similar tie-in deals in the future, so saving a few bucks on new releases by using a company's preferred credit card could become a standard perk - or inconvenience, depending on which cards you hold. Those who want to take advantage of the offer should consider picking up an American Express card, but be warned that most Amex cards carry an annual fee in excess of the potential $35 in credits. But you've got to spend money to make money, right?